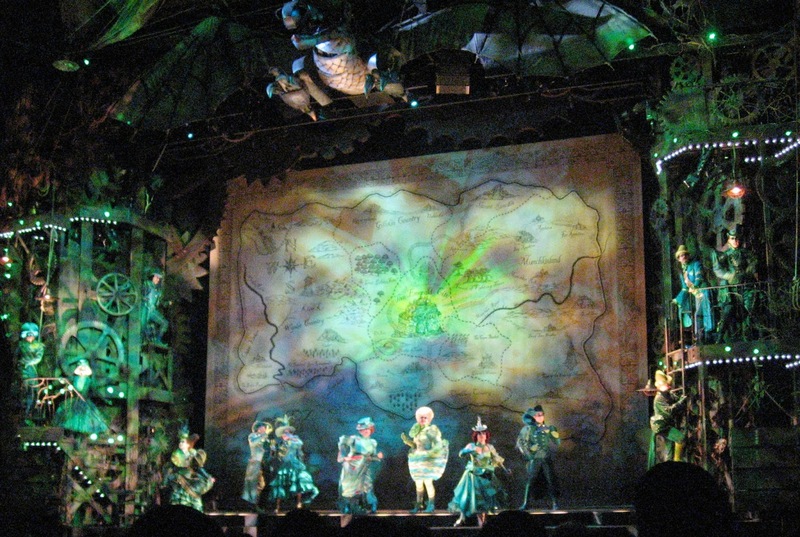 Wicked is not just a musical, it's an international phenomenon. Ten years after it opened on Broadway, it continues to sell out both on Broadway and on tour, and is number 11 (and climbing) on the list of longest running Broadway musicals. It has spectacular sets, fantastical costumes, and a huge moving dragon above the stage. But as many musicals have demonstrated, a big flashy production does not make for a great musical. The truly wonderful thing about Wicked is that in addition to all of the hoopla, it's a really great piece of theater. The Stephen Schwartz score is fantastic, with clever lyrics and endlessly singable tunes, the story is inspirational, and the characters are relatable; it's both showy and satisfying. I've seen it four times now, and listened to the score hundreds of times, and it never fails to move me. 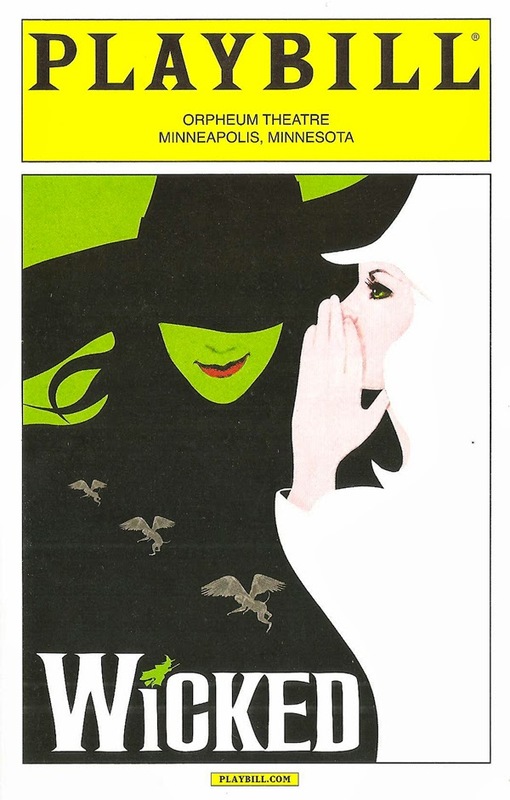 Several moments in the show are guaranteed to give me chills and bring tears to my eyes (namely, when Elphaba first takes flight in "Defying Gravity," and when she and Glinda sing about their friendship in "For Good"). Whether it's your first time seeing it or your 100th, Wicked is an unforgettable experience. In short, it's a nearly perfect musical. The National Tour of Wicked is stopping at the beautiful and historic Orpheum Theatre in downtown Minneapolis for a six-week run through the end of October. In case you've been living under a musical theater rock for the last ten years, here's a brief plot summary. Wicked is based on the book of the same name by Gregory Maguire, which is a re-imagining of The Wizard of Oz by L. Frank Baum. In this new mythology, before Dorothy and her house land in Oz, Glinda the good witch and Elphaba the wicked witch are two young women who find themselves roommates at school and become unlikely friends and allies. All is not right in the land of Oz; human-like Animals are seeing their rights and voices taken away. Elphaba discovers that the Wizard is behind all of this, and becomes a fugitive as she works against him to free the Animals. Glinda is seemingly on the Wizard's side, but the two never lose their connection, despite both loving the same man. 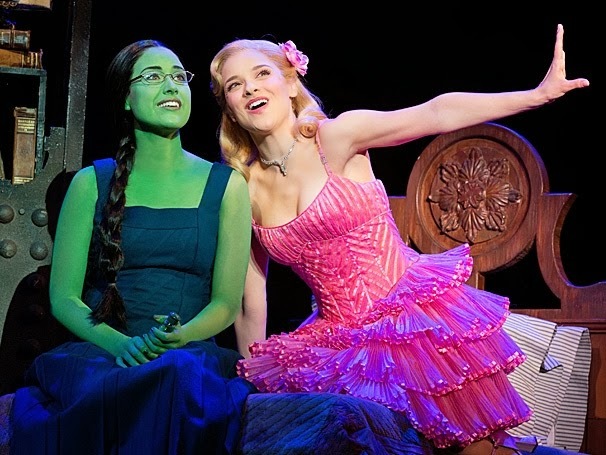 The romance is compelling but it is refreshingly not the focus of the show; Wicked is really about the friendship between these two very different women and each of them discovering who they are, and helping each other in that discovery ("Because I knew you, I have been changed for good"). Anyone who's ever felt like an outcast in any situation can relate to Elphaba; she's a wonderful inspiration, especially for girls to grow up as strong women ("I'm through accepting limits, 'cause someone says they're so. Some things I cannot change but 'til I try I'll never know"). Wicked explores the ideas of good and wicked ("are people born wicked, or do they have wickedness thrust upon them?") and the fact that in real life (and sometimes in musicals) it's never as simple as good and wicked, there's a lot of room in between where most of us live. Like Fiyero, Wicked is much deeper than its beautiful exterior might imply. The original Broadway cast is a tough act to follow (including Idina Menzel, who won a Tony for playing Elphaba, Kristin Chenowith, Norbert Leo Butz, and Joel Grey), but this cast does a phenomenal job of living up to the standards they set. Alison Luff is the star of the show as Elphaba, with a powerful voice and a believable transition from green misfit to political-activist-slash-wicked-witch. Jenn Gambatese is perfectly Glinda-like, which is delightfully bubbly but with a bit more depth as she discovers that getting your dreams is a little more complicated than it seems. Curt Hansen (from the first national tour of Next to Normal) is an appealing Fiyero who understandably makes all the girls fall for him. A couple of TV stars shine on the stage. Guiding Light's Kim Zimmer is enthusiastically evil as Madame Morrible, and '80s game show host John Davidson (who still has that gorgeous head of hair, now turned white) is a charmer as the Wizard who isn't what he seems, providing much of the biting social commentary ("there are precious few at ease with moral ambiguities, so we act as though they don't exist"). Supporting them is a huge ensemble of talented singer/dancer/actors who embody everyone from the green-clad citizens of Oz to flying monkeys. As I mentioned, the sets and costumes are incredible. From the school uniforms at dear old Shiz, to the black and white party outfits (men in skirts! ), to the circus-like green-hued wardrobe in the Emerald City, the costumes (by Susan Hilferty, who won a Tony for her work) just keep getting better throughout the show. The more spectacular elements of the set (by Eugene Lee, another Tony-winner) include the aforementioned dragon (who doesn't really figure into the plot, but looks cool), a bubble transport device for Glinda, and the huge talking wizard head. A clockwork motif runs through many of the sets, as if you're in the inner workings of some huge machine. Wicked features over the top sets and costumes, but it has a fantastic score and great story and characters to back it up. The production doesn't overwhelm the content, but enhances it. It's that rare musical in which all of the different artistic pieces come together to form a wholly satisfying theatrical experience. Unfortunately it's the most expensive theater ticket it town, which makes it inaccessible for some people. But if you can afford it, it's worth the money. (Or try your luck for $25 tickets in the daily lottery.) Unlike the first time it came to town seven years ago, it is not completely sold out, although weekend tickets are scarce. Visit Hennepin Theatre Trust's page to find more info about how to get your ticket to this wonderful world of Oz.